run over, it rolls over the top of a tire creating a distinct spiral. of narrative as well as a network of reoccurring signs. The organization of the moe-elements has rapidly advanced in the 1990s. The term moe is said to have emerged in the late 1980s, originally referring to the fictional desire for characters of comics, anime, and games or for pop idols. Since those who feel moe toward a particular character tend to buy its related goods excessively, the success of a project for the producers of such goods is directly determined not by the quality of the work itself but by its ability to evoke the moe desire through character design and illustrations. This tendency goes back to the 1970s, but its significance decisively increased in the context of the 1990s multimedia trend. can be broken up into. 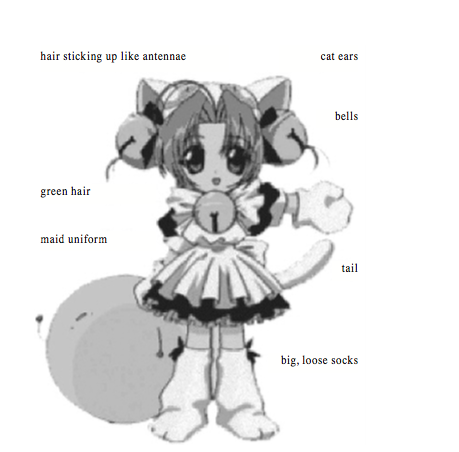 For example, the maid dress attire or piece of hair sticking up like an antenna are chara-moe elements. These elements can be laid atop each other and combined in infinite ways within one character. The moe in chara-moe refers to each element’s ability to attract or generate desire. Perhaps we can extend this definition to mark affectivity or desire as a whole, not just ocular attraction. Maybe ‘moe’ could be expanded to translate as a unit of affectivity. cue from the outcome of possible overlaps in fan demographics. Each character, or more broadly speaking, each object is composed of individual gesture-units. 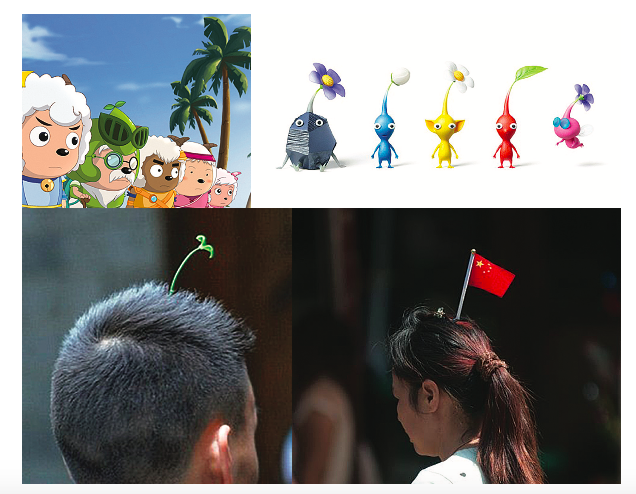 What would it look like to break down a derivative work based on its chara- moe characteristics and evaluate its worth or cultural importance on the criteria of dispersion and growth? This value assessment is more in line with the extent of a cultural object’s travel dispersion and audience overlap. Essentially it necessitates a theoretical tagging system for valuation, that incorporates attribution in its operation. The idea of chara-moe elements can be translated to understand cultural objects and their viral elements not as a linear history coming from an original source, as is the case and implication of simulacra. If the idea of a chara-moe database of elements were applied to culture and not just anime, we would see gestures as units. Perhaps using that unit would simultaneously register it, as a purchase would. Each use would be regarded as a transaction. An automatic ledger would be created to produce transaction-based knowledge about objects. also been the primary theoretical justification for claiming that the internet is not ‘about’ crediting. This is contradictory to the nature of the vast majority of information online being propagated by micro-communities. The assumption is that, because the internet is free, individual works belonging to a sub-community do not need to be credited when they are re-circulated — they can be borrowed, deployed and modified by whomever. This mentality is not just the case for images, but language as well––not just for funny memes, but for all culture depicted or created online. Who owns anime? Does Japan or do Japanese people own anime? or someone else’s Instagram unbeknownst to the person using it, is wrapped up in mid-internet days, a naive understanding of an ephemeral internet, perceived as some random void with obliterated authorship. we account for and properly attribute these uses which today begin to shape our everyday sense of culture and the people who produce it? to possess the most value is based on similar ideas of the original and authentic to be contained within a material object. This point was iterated concerning the monetary valuation of art objects, but it can also be applied to the cultural valuation for conservation and preservation efforts. a sculpture. Further, important objects of our time are not always made with the intention of lasting forever, or even for a long time. Maybe they are hardly even objects at all. Files last to an extent. The context for understanding an idea’s contextual placement in relation to other things — not just time period — becomes the most important thing to preserve. But who will make this database of gestures? There are times when we are unaware we are creating a ledger — that a database is already being cultivated. Often when thinking of data, the impulse is to track the behavior of users instead of using that technology to keep record of the cultural production of users, for the benefit of users. The scope of transactional data is limited in that it has only been viewed as a method of commodification or surveillance. Transactional data is not inherently encroaching on the privacy of individuals, it depends on the type of transaction being documented. Transactional data is not inherently surveillance capitalism. Such a perception is due to the overwhelming uses of transactional data for surveillance and social research to compile more valuable and organized data sets for marketing and politics. This process places the users’ own data in the service of other uses hidden from view — rendering it useless to the user. However, in service to its contributor, logging transactional data can also type of attribution (crediting), or keeping record, (for example metadata). Rather than keeping record of individuals, we can keep a record of things attributing contributors. This concentration of capacity might explain why popular online platforms which collect, tag and analyze social data are able to cause a displacement of social research to few select centers. Those with the resources equipped for the central storage, processing and valuation of data at such a large scale and speed direct the uses of such research. The ideas, values, and purposes of the culture from which the object comes. Second, there are the ideas, values, and, certainly, purposes of the arrangers of the exhibition. These are likely to be laden with theory and otherwise contaminated by a concept of culture that the viewer does not necessarily possess or share. a digital object arises from, is often not shared with the arrangers, value assigning, and researching bodies contextualizing it. How might we understand an archive of digital activity as it was experienced by those whose lives we are examining? Digital sociologist Noortje Marres suggests “digitization may be unsettling established divisions of labor in social research.” In regard to the labor of research within digital sociology, she provokingly asks, “If a multitude of people are contributing data is the data then scraped by social researchers compiled of the labor of those individuals rather than the labor of the researcher?” This question leads us to ask what it would mean for science to acknowledge the contributions of ‘non-scientists’ as meaningful. Such a consideration might problematize the status of social scientists’ or professional knowledge. Several research initiatives employ the work of ‘amateur’ researchers who work collaboratively and collectively. Each person contributing snippets of information, or processing power. 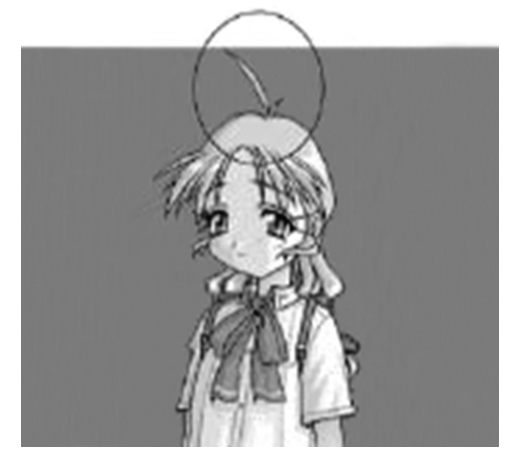 Perhaps we had a database that enabled us to track the sequence in which units or the chara-moe of culture we contributed to arose and proliferated online. This is a hypothetical proposal for use-units or gestures to be logged as a transaction, automatically as they are used. By using a new sign or characteristic, or in combination with a few elements, we immediately see its prior uses. Each whole object is always a composition of several gesture-units. The definition of a gesture-unit is constantly changing based on its use. The only thing immutable about gesture-units is that they can be called upon with the same name. Essentially, a link that never dies. Philosopher Nick Bostrom, author of Superintelligence: Paths, dangers, strategies, anticipates various scenarios in which a machine would learn, “A system might thus greatly boost its effective intellectual capability by absorbing pre-produced content accumulated through centuries of human science and civilization: for instance, by reading through the internet.” Perhaps we can re-organize the way we see cultural production by thinking of how we might teach a machine, the way a machine could understand it directly. 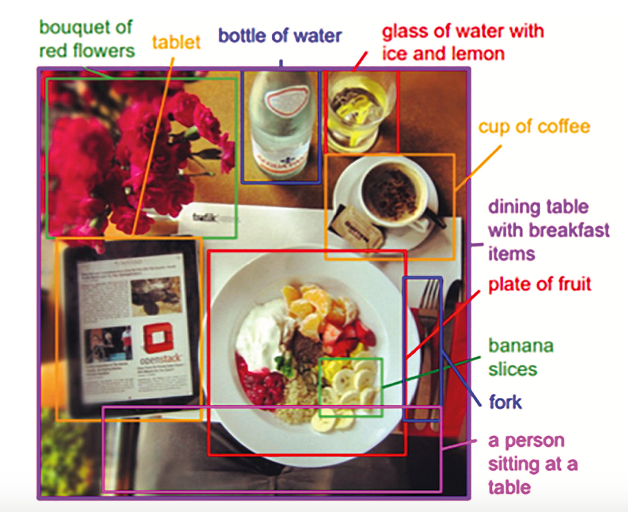 What I am proposing might look similar to an architecture of neural networks to teach machines to read images and identify objects and actions within a landscape or scenario. its viral appearance cannot be contained within the realm of fiction. Likewise this ledger could extend beyond image recognition to other sensorial gestures, fluidly. Instead of thinking of how our everyday is becoming digitized, this hypothetical chara-moe organization of information about everything has already been employed in the networked everyday of ‘smart’ anything, transactional interfaces and our affections when interacting. All movements and sensations can be de-coded in some fashion within our mind or in our environment, as they leave a trace across sensorial interfaces. The gesture of a spiral is a unit that appears combined with other materials (hair, tire, death) and its record is already being processed in such a way for machines and other intelligence to read us.